The wave is above the [water] ground. The wave is giant. There is a big surfboard in the top of the wave. A small idol is on the top of the surfboard. The surfboard is facing west. The surfboard is brazilian. 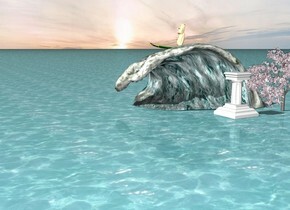 The pedestal is in front of the wave. There is a cherry tree right of the pedestal. It is afternoon.